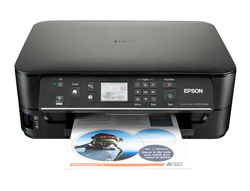 Trusted Reviews has tested a multifunction printer from Epson. The printer is called Epson Stylus SX525WD and is able to print up to 36 pages per minute, or so Epson claims. Let us hear what the reviewer thinks about this All-in-One printer. Trusted Reviews ends up giving the SX525WD an overall score of 8 out of 10 possible points. The Epson printer scores highest on features, value for your money and prints speeds while it scores a bit lower on print quality. Even though the claims from Epson about print speeds are too high this printer is pretty fast and comes with a low price tag. If the print quality had been better I’m sure that this printer would score even higher. Read the full review of the Epson Stylus SX525WD All-in-One printer here.